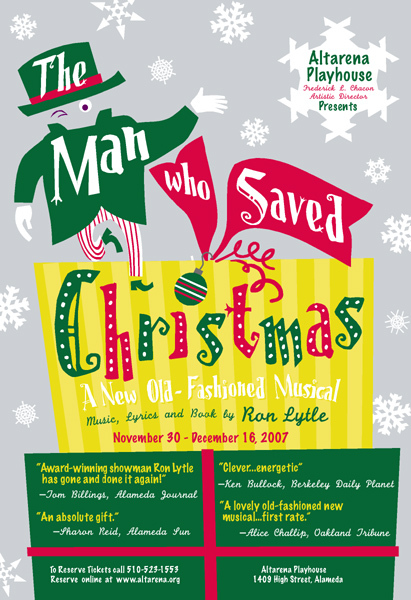 Last fall Ron Lytle prevailed upon me to design a poster for his new musical The Man Who Saved Christmas. I obliged, but I was under some time constraints, and I wasn’t entirely happy with the design I came up with. Fortunately, the show is being brought back this year, and I was able to tweak last year’s design into something more pleasing. Very retro, I know. To me this looks like the cover of a kids’ record album circa 1955, when kids’ albums still came as boxed sets of 78’s. The show itself is set during WWI, so there would seem to be a disconnect. But Ron’s writing style hearkens back to the mid-century “golden age” of musicals. Besides, just looking at the poster puts me in a Christmas-y mood.